Creating Conditions for Success: A Report About Picky Eating - Energetic Juniors - Contact Us! A mom walks in with her 4-year-old son. Neither growth nor nutritional flags appeared in his record. Mother reports that the pediatrician raised no concerns. Then, I see that he has a history of feeding problems and is on the autism spectrum. Mother reports mealtimes as very stressful. After getting more details, I pull out some dried figs I had that day for a snack. I tear them up and suggest that the mother and I eat the fig pieces as we continue to discuss her child’s needs. I also ask that she let her son alone as he calmly plays with the office toys. She gives me most of her attention. We continue nibbling. After a while, I wordlessly offer her son some figs, letting him take his time. He takes and chews one and then some more. His mother is surprised. This is just the kind of texture he usually refuses. We discuss how she can try being patient at home. Three weeks later, his mom reports less mealtime stress. I knew things improved before she told me because of the way she smiled. Even though, she soon told me, her son lost interest in figs. Mother took a strategic retreat: she learned to patiently relax. She stopped pushing him to eat. In the embrace of his mom’s relaxation, the boy picked up a social skill and a new food. In the social domain, he began to use a knife and a fork. In the nutritional domain, he began to like scrambled eggs. Just as well because his limited diet needed the nutritional power punch of the simple egg. Eggs have vitamin A, protein, and choline, a nutrient with, some think, play a role in emotional balance. The egg also contains lutein and zeaxanthin, carotenoid nutrients usually associated with kale. 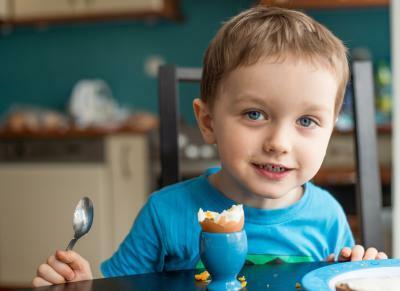 Like many other children, he avoided vegetables with their antioxidants, phytochemicals and vitamins so the eggs were more than a new food. Here is one explanation for the changes. Mother told me she struggled internally for a couple weeks being patient. She let her son eat and not eat at his own discretion. Letting children determine what they eat after the parent has determined what is presented as well as when, and where the eating happens is the recommended approach. Following this guideline sounds simple and it may be hard to follow after a history of delays or struggles. Mother revealed that her heart felt like it twisted at times as she struggled with herself rather than her son. That fig moment kept her going. Mealtime stresses became replaced with a smile. That was the smile in the waiting room. The mother learned to create conditions that allowed her son’s behaviors to change. These behaviors had escaped prior assessment. It is possible that the family’s routine mealtime stresses clouded the assessment. When it comes to nutritional behaviors, children and adults can have definite problems that need evaluation. These same people also need patience for their own hidden potential to emerge in the company of family and friends.